Puerto Portals, Spain, August 25 2018 – The fourth and penultimate stage of the 52 Super Series, the racing circuit dedicated to the TP52 monohulls that started last May in Croatia, came to an end today on the island of Mallorca. After an uncertain start of the week, characterized by a day of stop due to lack of wind on Tuesday August 21st, coupled with a breakage in the bowsprit, Luna Rossa reacts and wins two consecutive races in the 5th and 6th races. The team closed the final day of the Puerto Portals sailing week with a third place in the ranking in which 6 boats contended the podium. 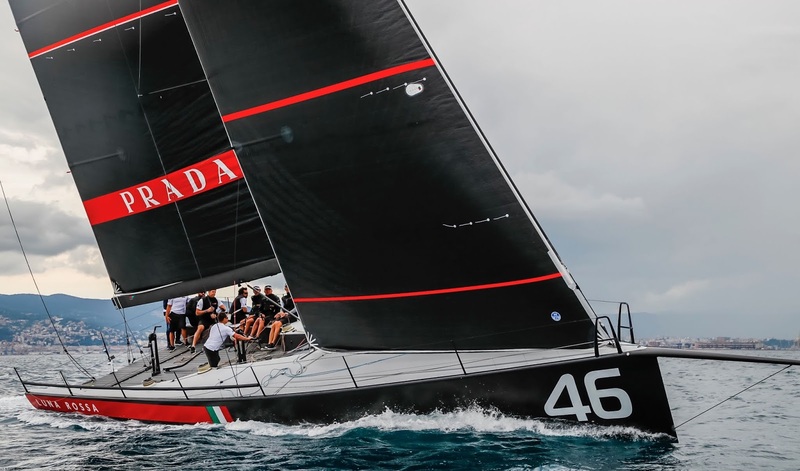 Unstable winds and an over the line start in the first race of the day hindered the team’s efforts and Luna Rossa closed the event fifth. “This final day started on an uphill. We were set up for a good start, knowing that this fleet pushes hard on the starting line and that the outcome is often written in the first two or three meters. Unfortunately, we took too much of a risk and from then on the regatta became complicated. The second race was a real shame: the first part was really good until the wind shifted of 40 degrees and we made a mistake in assessing the situation which left us at the end of the fleet. It’s a tough and disappointing result. The positive outcome for us is that our boat speed has increased, both upwind and downwind, and we intend to take this edge with us to Valencia and to exploit it to our advantage”. “We have three weeks before the Valencia event to analyze our mistakes and learn a positive lesson. Our three-year journey towards the America’s Cup has started with this 52 Super Series and is aimed to bring us to the maximum results possible. The extremely high level of competition in this circuit has highlighted the aspects we need to work on and improve. It’s an excellent testing ground for us to optimize the configurations on board and to improve our strategies”. The final stage of the 52 Super Series will take place once again in Spain, in Valencia, from September 18 to 22.